Since the version 1.1 of Admixture with supervised option came almost two months ago, I have been salivating over it. My original use case for it is not possible (for now). I wanted to be able to assign a few of the K ancestral components to specific reference populations and let the other ancestral components fall where they may. But we can do supervised admixture only by assigning all K ancestral components. You can get the extra precision (and false sense of accuracy) here. 23andMe takes advantage of publicly available data for four populations studied extensively via the International HapMap project (hapmap.org). That project obtained the genotypes for 60 individuals of western European descent from Utah, 60 western African individuals from Nigeria, and 90 eastern Asian individuals, 45 from each of Japan and China. Because the two eastern Asian populations are geographically near one another and relatively similar at the genetic level, 23andMe combines these to form a single eastern Asian reference population. So I dug up my reference admixture run at K=3 and found the same number of samples of these HapMap populations by looking for those samples which had the highest percentage in the respective component. 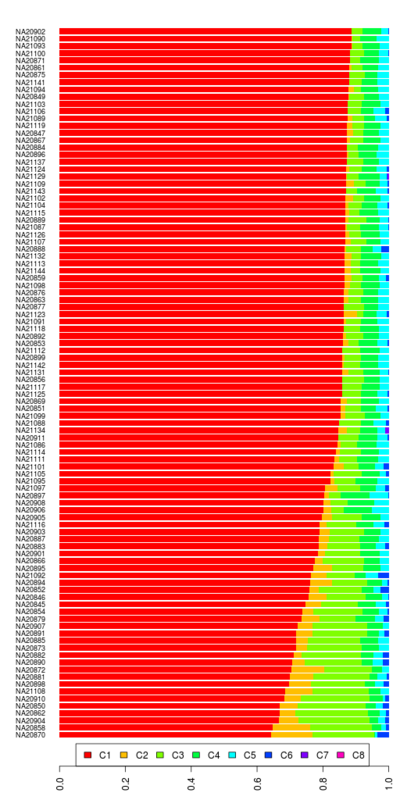 Then I combined these 210 samples from the HapMap with 74 Harappa Project participants (HRP0001 to HRP0079, excluding 5 who are related to others). The results of the supervised admixture run are in a spreadsheet and also shown in a bar chart below. Since I did run an unsupervised K=3 admixture analysis of the first Harappa batch with the whole reference I populations, you can compare these results to those. So I went back to HapMap, which you can download from their website. I am using HapMap 3 public release #3 from May 28, 2010. I found one set of duplicates, NA21344 is identical to NA21737. And a whole bunch of pairs with high identity-by-descent values, which I calculated using Plink. You can see the samples with PI_HAT greater than 0.5 in this spreadsheet. PI_HAT is the proportion IBD estimated by plink. Notice also that all these pairs also have high IBS similarity (the DSC column), more than 85% similar in fact. All the 41 samples I have removed as a result of this are listed in this spreadsheet. I am interested in North African populations due to my own heritage, so when Razib alerted me that Henn et al had a paper out about South African origins of humans and their African dataset was publicly available and included populations from all over Africa, I immediately downloaded it. The eastern Asian components are enriched among Bengalis, as youâ€™d expect, but theyâ€™re found in different proportions among many individuals who hail from the northern fringe of South Asia more generally. It seems clear that the further west you go, the more likely the â€œeasternâ€ element is going to be Turk, while the further east (and to some extent south) the more likely it is to be more southernly in provenance. To do a better job though, it would be better to have more than the Yakut as an examplar of the Siberian component as I have done till now. Therefore, I downloaded the arctic populations dataset from Rasmussen et al. Combining Henn et al and Rasmussen et al with my previous datasets (HapMap, HGDP, SGVP, Behar et al and Xing et al), I got 3,970 samples with a total of 1,716,031 SNPs represented, though at 99% genotyping rate it gets reduced to about 27,000 SNPs. I did not remove any populations or individuals except for any duplicates and non-founders. Here's the information on the populations represented in this dataset. Now I am on the lookout for more datasets that are public, have enough SNPs in common with this set and can easily be converted into the Plink PED format. So if you know of any, let me know. May be I will have the biggest and most diverse dataset with your help. Combining my reference population with Xing et al data gets me 3,222 3,161 samples but with only about 23,000 SNPs after LD-pruning. The good thing is that this dataset has 544 South Asian samples from 24 ethnic groups. So it'll be useful for some analyses despite the low number of SNPs. I'll try to run parallel analyses on my reference population and this dataset so we can compare the pros and cons of both. UPDATE: I removed 61 pygmy and San samples. I am using several datasets in the public domain for my reference population samples. HapMap is one of those datasets. The goal of the International HapMap Project is to develop a haplotype map of the human genome, the HapMap, which will describe the common patterns of human DNA sequence variation. The HapMap is expected to be a key resource for researchers to use to find genes affecting health, disease, and responses to drugs and environmental factors. The information produced by the Project will be made freely available. 30 Yoruba adult-and-both-parents trios from Ibadan, Nigeria, 30 trios of U.S. (Utah) residents of northern and western European ancestry, 44 unrelated individuals from Tokyo, Japan and 45 unrelated Han Chinese individuals from Beijing, China. In their HapMap phase 3 release #3 (NCBI build 36, dbSNP b126), there are 1,397 samples with about 1,457,897 SNPs each. I removed related individuals as well as individuals whose genomes were too similar. This left me with a total of 1,149 samples with about 474,606 SNPs in common with 23andme's version 2 data. Since we are not interested in Native American ancestry, I also removed 58 Mexican samples, thus leaving me with 1,091 samples. The region assignments are mine to aid me in the analysis, by including/excluding samples by region or by aggregating results by region to find patterns etc. It was easiest to use the HapMap data since it's available for download in Plink format.